SmartServe 4-in-1 High Chair - Clayton is rated 4.8 out of 5 by 21. Kids grow up fast, and this convertible high chair grows with them. The SmartServe 4-in-1 High Chair from Ingenuity offers beautiful design and intelligent functionality that parents need to keep up with their quickly developing kids. 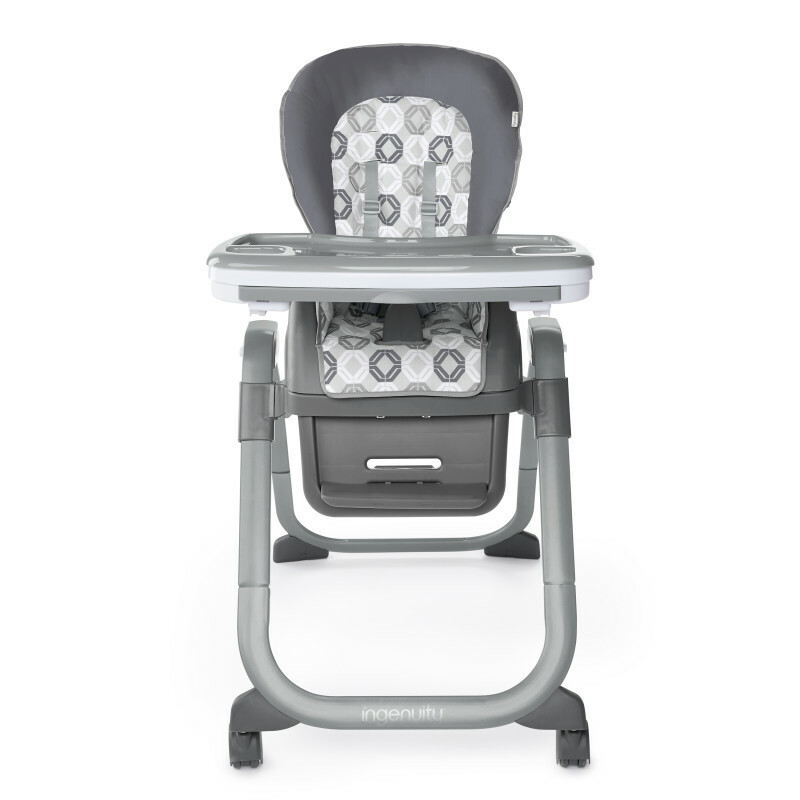 There are 4 ways to use this high chair as your baby and your family grows. Choose between the full sized high chair setting, booster seat setting, toddler chair setting, or use the booster seat and toddler chair to seat two kids at once! The swing tray design moves out of the way with just one movement and just one hand, making it easier to take baby in and out. Tucked discreetly inside is a second tray made just for parents. Pull out the hidden-drawer tray for easy access to flatware or other items that you can store right inside. You can also use the tray extension to keep things out of baby’s reach. The detachable tray and insert are dishwasher safe, and the fabric seat pad and straps can be tossed in the laundry. Every option gives your baby a seat at the table for more meaningful mealtimes and less kitchen cleanup. High chair, booster, toddler chair, or seat 2-kids-at-once! Dimension (in) 31.25" x 24" x 44.5"
Seat pad – Remove from frame. Machine wash with cold water, gentle cycle. No bleach. Tumble dry, low heat.Tray - Dishwasher safe. Wipe clean with a soft, clean cloth and mild soap.Frame – Wipe the metal frame with soft, clean cloth and mild soap.Harness/Straps – Machine wash with cold water, gentle cycle. No bleach. Air Dry. Rated 4 out of 5 by Rosie C from Easy to use, convertible high chair I really like this highchair. It was easy to set up and I love the different configurations available. The colors are neutral and look great in my kitchen. The one con to this highchair is that it's not super easy to clean. I have to remove the fabric insert after every meal. Besides that, it is a wonderful highchair that I definitely recommend. Rated 5 out of 5 by RogFam from Does it all Wow I love this high chair. It really does it all and has grown with my baby through fhe different stages of feeding. I’m all about getting a product that I can use for a long time and I’m willing to spend more money knowing it’ll last me, well this is just that. Rated 4 out of 5 by CaitG from Lots of options We love this high chair. There are so many options with this high chair. We can use it in 4 different ways - full sized high chair, as a booster seat, as a toddler chair, or as a booster seat and toddler chair at the same time for two kids. Not only is the adaptability wonderful but the functionality is all there. The swing tray moves out of the way so I can easily swing it open and closed and put my baby in and out easily. I love the extra tray for serving pieces, washable cover, and washable tray cover. This high chair is great for a baby that grows so quickly and needs lots of option. Rated 5 out of 5 by Katlinwatts15 from High chair I needed a new high chair for a while after we had our last baby! We got this one and I absolutely love it! It’s so convenient and easy to use and our little girl loves sitting it in! Rated 5 out of 5 by Katlinwatts15 from High chair I needed a new high chair for a while after we had our last baby! We got this one and I absolutely love it! It's so convenient and easy to use and our little girl loves sitting it in! Rated 5 out of 5 by Ronnie from Awesome High Chair We use this high chair all the time! It's well built and easy to use. Baby boy loves when he gets to join us at the table like a big boy! Rated 5 out of 5 by Bkelly217 from Great quality This is a really great quality high chair that will last with your child. My son is two and we had another brand of high chair that didn’t last. This high chair is absolutely perfect for him. The set up is extremely easy, it look less than 10 minutes. You can choose to put the chair on a dining room chair or use the legs/stand that comes with it. It’s very easy to go between the two as well. I love that this high chair has a large tray. The tray also connects on so it can swivel in and out! You can simply remove the tray and it’s cover and put it in the dishwasher. Very easy to clean and it’s the perfect size for my toddler. Rated 5 out of 5 by Bkelly217 from Great quality This is a really great quality high chair that will last with your child. My son is two and we had another brand of high chair that didn't last. This high chair is absolutely perfect for him. The set up is extremely easy, it look less than 10 minutes. You can choose to put the chair on a dining room chair or use the legs/stand that comes with it. It's very easy to go between the two as well. I love that this high chair has a large tray. The tray also connects on so it can swivel in and out! You can simply remove the tray and it's cover and put it in the dishwasher. Very easy to clean and it's the perfect size for my toddler.